The country music of the iHeartRadio app will come to life onstage in Austin with an extraordinary lineup of the hottest names in country music including Tim McGraw, Brantley Gilbert, Rascal Flatts and Brad Paisley, with more to be announced, and will be hosted by iHeartMedia’s nationally-syndicated Country music personality Bobby Bones. The New Orleans Jazz Fest is said to be the most diverse festival in the country and has been attracting the biggest music acts in the world from all genres year after year for decades. It’s one of the first and consistently one of the best music festivals in the country. 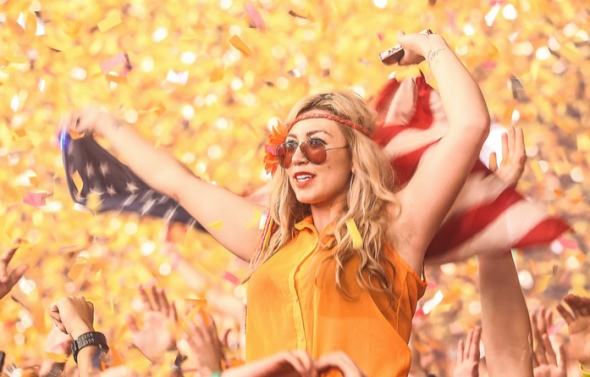 Sunset Music Festival has announced the lineup for its Memorial Day Weekend event, set to take place at Raymond James Stadium in Tampa, Florida. Tiesto and Skrillex will be co-headliners on Saturday, while Armin van Buuren will headline on Sunday. Joining them will be Flosstradamus, Porter Robinson, Showtek, and many more. Now in its fifth year, Electric Forest has become one of the most popular summer music festivals in the United States! This year’s festival is scheduled in Rothbury, Michigan, along Lake Michigan on Double JJ Ranch. Walking amongst the enchanted forest reveals all sorts of tucked-away magic. From surprise performances, dance parties, garden sculptures, bars, all the way to extravagant lights illuminating the Sherwood Forest. With everything the festival has to offer, it definitely stands out from your average music festival. Naturally it’s easy to recognize that here are plenty of festivals throughout the summer to suit anyone’s taste in music, but it’s important to remember a few things. A fantastic event means you’ll want to share all of the extraordinary moments with your friends using your mobile device, but what happens when the battery runs low in the middle of the festival? Ideally the venue will have a cell phone charging station such as this one from Veloxity as a solution. These stations can accommodate 98% of all smartphones to ensure that no matter what happens at the festival, you’ll always stay connected.